← Candy Give-away! That’s right, free candy! There are a few special sweets that only get made, and eaten at this time of year. Maybe that’s why they are so special. Or, maybe that’s why this time of year is so special. People will make, and eat candy and cookies while not feeling a bit of guilt. In fact you’re supposed to eat it, or risk being visited by three ghosts. So, here are a few of my favorites. I’d love to hear about holiday treats that are special to you. This comes from the blog Taste of Koko. I’m going to make this really soon, maybe even tonight. I’d leave work right now if I could…..
Now let’s talk gingerbread cookies. I have a recipe that includes a weird ingredient….wait for it…Jello cook and serve butterscotch pudding. Like I said, weird. I came upon this recipe on allrecipes. com after I had made some killer gingerbread cookies for a neighbor, and then lost/forgot what recipe I used. She kept raving about those cookies, so the pressure was on. I made a lot of batches trying to recreate them, and then stumbled on this recipe. It’s so easy. Often, I make the dough one day and keep it in the refrigerator, and make the cookies later. A few tips: roll the chilled dough between sheets of parchment paper, cut out the shapes and place on a parchment lined cookie sheet. Chill the cookie sheet for 5 minutes in the refrigerator before baking. This will keep the cookies from spreading too much. Sometimes I just use red hots for buttons, and call it good, or they can be naked (no one has been offended yet). I also cut them into stars and hearts to change it up a bit. Yesterday I tried a simple peppermint icing and it made them even better. I whisked 1/2 c. powdered sugar with about 4 Tablespoons cream, and 1/8 tsp peppermint extract. I added more cream, teaspoon by teaspoon, until it was the consistency I wanted. Then, I spooned the icing into a zip top sandwich bag, cut off a tiny bit of the corner of the bag, and piped little button and smiley faces on the cooled cookies. The icing needs to dry for at least 1/2 hour before storing or stacking the cookies. I’ll update this post with a photo next time I make another batch, which will probably be in the next few days. Everyone loves these gingerbread cookies. My kids empty the cookie jar, and take them in their lunches. When you make these, let me know what you think. 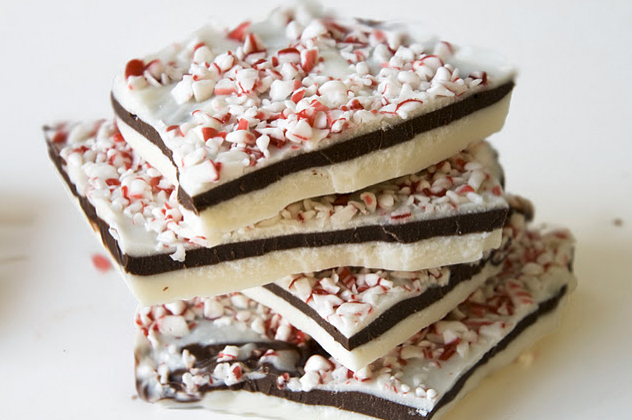 Posted in Childhood memories, Christmas, Cookies, Milk chocolate, Minty, White Chocolate. Bookmark the permalink.